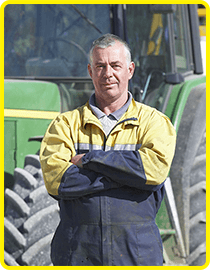 not only deal with drought stress better ……. 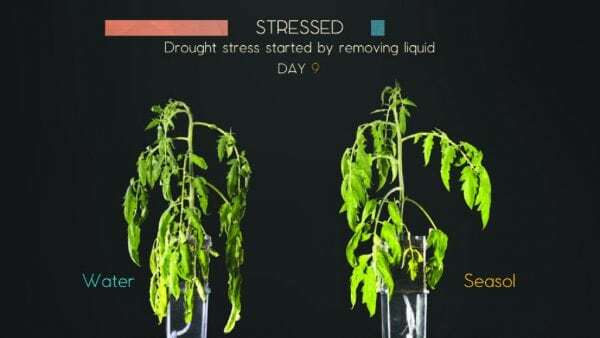 The tomato drought test was developed at Seasol International R&D Department and the experiment observed using high resolution time lapse photography. A wicked magenta jar system was used to grow tomato plants. A single magenta jar container, filled with a premium potting soil containing a granular fertiliser with a 4-week old tomato seedling (variety: Grosse Lisse), was placed on the top of a second magenta jar (liquid reservoir container). A hole was predrilled in the top jar. A wicking thread was used to connect the jars, transferring liquid to the soil from the liquid reservoir. The reservoirs were filled with the treatments: Seasol Commercial Seaweed Concentrate (1 in 400 dilution) or Water. The treatments were refilled as needed. 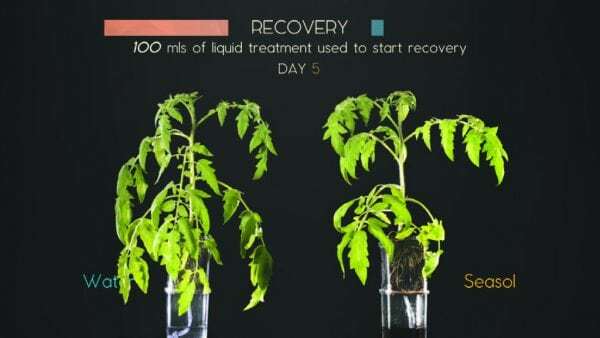 The tomato plants were grown – without any drought stress – by supplying the bottom magenta jar with their respective liquid treatments. 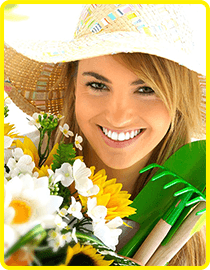 The plants were grown for 21 Days in a climate-controlled greenhouse set at 24°C. Drought stress was induced by removing the liquid from the lower containers (liquid reservoir). The plants were exposed to drought stress for 5 days (26°C). 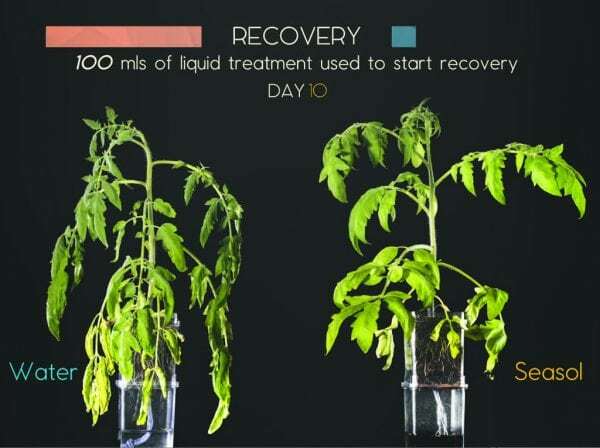 Plants were progressed to the recovery test stage (from drought stress) by applying 100mL of liquid to the lower liquid reservoir container. Water was used for the Water Control treatment and Seasol Commercial Seaweed Concentrate (1:400 dilution) for the Seasol treatment. The plants were exposed to the liquid supplementation for 2 day (26°C). After 2 days no liquid was in the lower container. Drought stress started again when no liquid was in the lower container. 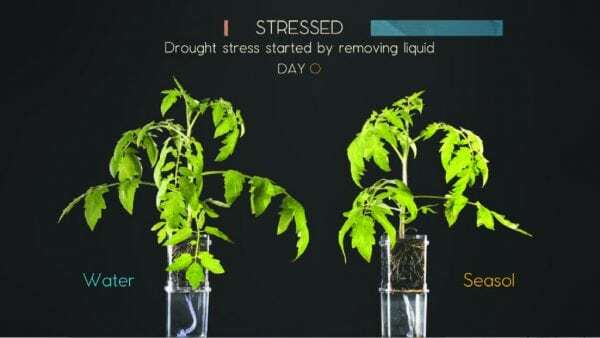 The plants were exposed to drought stress for 3 days (26°C). 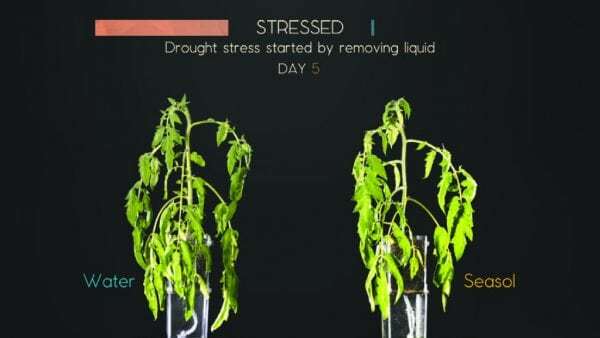 Plants were progressed to the recovery test stage (from drought stress) by applying 100 mL of liquid to the lower liquid reservoir container. 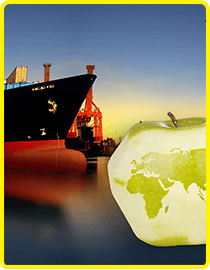 The plants were observed with the liquid supplementation for 2 days (26°C).